Berg Adventures kicks off another great trekking season along the trail to Everest Base Camp. This year’s first group is a group of close friends united to share further adventures together. Joselyn and Todd Miller (Laguna Beach, CA), Guy Kornblum (San Francisco, CA) and Thom Niederkofler (Berlin, Germany) met on "Semester at Sea" during the Fall of 2002 where they sailed to Havana, Cuba. In October of 2004, the four of them embarked on another journey together and reached the summit of Kilimanjaro with Berg Adventures. They are dedicating this expedition to Todd’s father who recently went through two brain surgeries. He came through the surgeries like a champion and he is progressing along very well with his recovery. 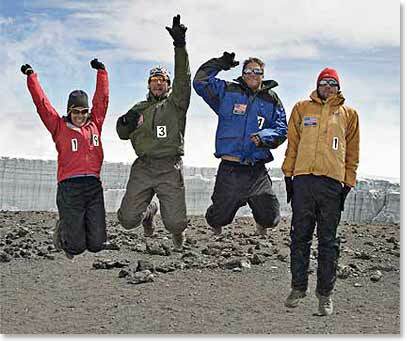 They will be making a donation to Kunde Hospital the day they visit there on their way to Everest. The hospital was originally funded by the Himalayan Trust in 1966. It was a project that was very dear to Sir Edmund Hillary, whose death earlier this year has profoundly affected the Sherpa community. Join the team, with their chief guide, Ang Temba and the rest BAI trekking staff as they walk in shadow of the greatest mountains on earth, visit the colorful villages and monasteries of the Everest Region, celebrate life and soak up new experiences each day. April 3, 2008 – Greetings from Namche Bazaar!